Intervention in Syria remains popular with liberals who hold that the United States, NATO, and allied Middle Eastern states have a ‘responsibility to protect’ Syrian civilians under military siege in Homs, Hama, and parts of Damascus. Russian and Chinese intransigence has made it clear that diplomatic progress at the UN is a non-starter, and despite a decade of assertions that another Hama or Tiananmen Square couldn’t happen in the age of Twitter and camera phones, the Syrian government seems intent on killing its own citizens until someone physically stops them. But there’s a blind spot in the interventionist argument. As other have noted, it’s not clear if killing Syrians to save other Syrians is especially moral, or if taking sides in an ongoing civil war is an especially wise policy for the United States — history suggests it isn’t. But my concern with the rhetoric of liberal, rather than neoconservative, interventionists is more practical. Unlike Libya, the vast majority of combat in Syria is within densely packed cities. NATO and allied air assets could likely destroy Syrian artillery units operating outside of cities with a minimum of civilian casualties, but actually stopping the violence would require engaging regime forces within cities. While it’s possible that a US intervention would begin with the mandate to avoid airstrikes in cities, it’s doubtful this limitation would last — as Libya proved, when NATO’s bound its credibility to victory, escalation becomes a very slippery slope. As anyone with a passing familiarity with air operations in Iraq knows, it’s very difficult to avoid collateral damage when conducting air strikes in urban areas, even for the smart munitions-rich USAF. Liberals protest the loudest when the US military kills civilians — which, of course, we have good reason to. But the magical thinking that “just wars” launched by a responsibility to protect can somehow miraculously avoid the civilian casualties air strikes in Iraq, Afghanistan and Pakistan haven’t is nonsensical. War is a dirty, brutal business. Wars in cities are even dirtier. NATO’s experience in the Balkans, Iraq and Libya suggest that airpower alone can’t protect civilians in Syria, or even coerce a diplomatic solution. Intervention in Syria is an open-ended commitment without a clear path to victory, and one Western policymakers should be wary of despite the moral imperative to ‘do something’ in the face of atrocities. Advocates of the responsibility to protect need to be aware that an intervention to save Syrians will kill others just as surely. Whether these dead are legitimate targets are not, their deaths create grudges whose effects are measured in decades and long-term consequences we can’t predict. As analyst Andrew Exum recently noted, perhaps “when it comes to post-conflict stabilization and reconstruction, most liberal interventionists are no better than most neoconservatives.” It’s possible to argue that these costs are justified by the potential to halt the slaughter of the Assad regime, but basing the case for war on best-case assumptions is an argument in bad faith. 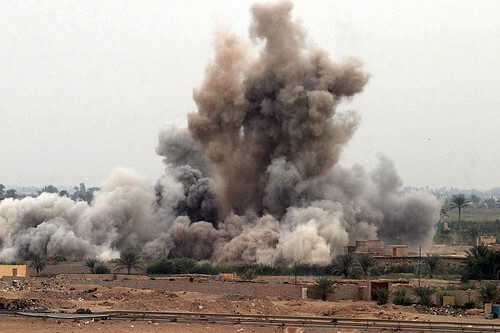 US airstrike during the Second Battle of Fallujah. U.S. Marine Corps photo by Lance Cpl. James J. Vooris, via Wikimedia.